The Beatles Through The Years: The Paul.....Hotel? Meet Paul....but have we already met him? Now, I'm a little bemused by this hotel's theme. It's not a Beatles theme or a Paul McCartney theme but....it is. I mean, this could easily be misconstrued by every Beatles fan. Especially when you have a quote like THAT on the wall that every fan knows. Could this be a hotel that Macca himself has a stake in? or has secretly opened because he has a burning desire to go into the hotel business but doesn't want to be TOO obvious? A collection of drawings from a local artist that are featured at The Paul hotel. 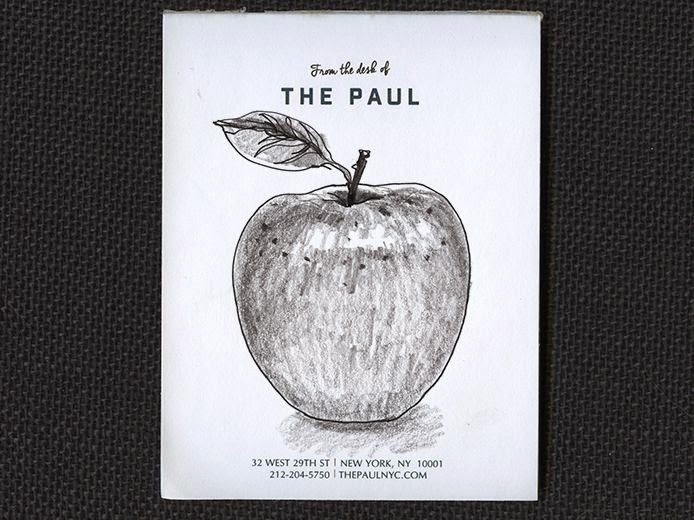 Now, the Apple is synonymous with New York City (The Big Apple) and since the hotel is in NYC its easy to see how and why this sketch is in the hotel. But of course there's also that other Apple, and I don't mean the fruit, or the company whose product you may be reading this blog on now, I mean the Apple Corps that was formed by the Beatles themselves in the late 60s to secure their interests and also put out their records. ......The Walrus is apparently staying at The Paul. Or it may not be. It may have checked out by now.